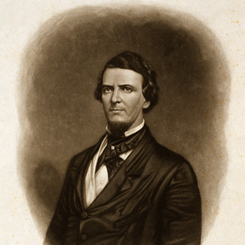 Image courtesy of Library of Congress South Carolinians returned Representative Preston Brooks to the House in a special election to complete his own unexpired term in the 34th Congress (1855–1857). On this date, Representative Preston Brooks of South Carolina, accompanied by Representative Laurence Keitt of South Carolina, severely beat Senator Charles Sumner of Massachusetts with a cane in the Senate Chamber. Brooks’s violent act was in response to a speech in which Sumner attacked the institution of slavery and pro-slavery Senators such as Andrew Butler of South Carolina (Brooks’s relative). Sumner’s injuries were so serious that he had to take leave of his Senate duties for three years in order to recuperate. In the aftermath of the violent confrontation, Brooks was fined for assault by a Baltimore district court. Moreover, Senators called for an investigation of the incident and angry House Members demanded the expulsion of Brooks and Keitt. The House failed to garner the necessary two-thirds vote to expel Brooks, but it successfully censured Keitt. Both Congressmen resigned to protest their treatment by the House. In his resignation speech, Brooks said, “I should have forfeited my own self-respect, and perhaps the good opinion of my countrymen, if I had failed to resent such an injury by calling the offender in question to a personal account.” South Carolina voters held Brooks and Keitt up as heroes, returning both men to Congress by special election to fill their own vacancies, while anti-slavery propagandists portrayed Sumner as a martyr for the cause of abolition. The event inflamed sectional tensions between northern and southern Members of Congress.